Arteriovenous fistulae (AVFs) can be difficult to cannulate for a variety of reasons. Cannulation sites can be deep and veins can become difficult to palpate. This is especially true for the large segment of the population that is obese. For otherwise functional but noncannulatable fistulae, the Venous Window Needle Guide (VWING) was designed to make cannulation easy. 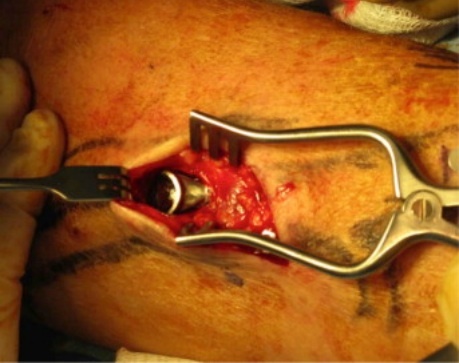 The titanium device works by creating a larger area for placement of the needle. 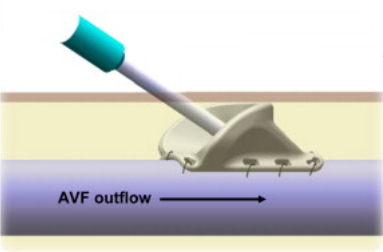 The funnel-shaped device guides the needle to the AVF. This allows for repeated access at a single puncture site. 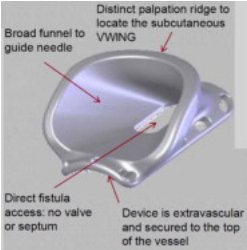 The Venous Window Needle Guide for Salvage of AV Fistulae (SAVE) trial evaluated the efficacy and safety of this device. The study included 54 patients with noncannulatable but otherwise mature AVF. Patients had 1 or 2 VWINGs implanted (average 1.5). After implantation, 100% of the devices were palpable. Palpation was rated as “easy” for 93% of devices and “moderate” for the remaining 7%. After implantation, 96% of these patients were successfully cannulated. The rate of device-related adverse events was very low (0.31 per patient year). At 6 months, all of the AVFs were still functional. The results of the study demonstrated the VWING being an effective device for use in patients with noncannulatable but otherwise functional AVFs. They showed the device has the potential to decrease the number of procedures and catheterizations that these patients would require. These could decrease hospitalizations due to the lower morbidity and mortality rates associated with AVFs.